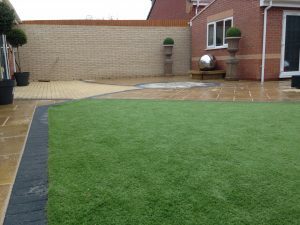 More and more people are tuning to artificial turf for their lawns and gardens nowadays, for a whole range of reasons. A professionally provided artificial lawn stays green and vibrant all year round, and comes with none of the expense and hassle of maintaining grass. A good artificial lawn both looks and feels like the real thing. With a host of both monetary and environmental perks, it’s not difficult to see why it’s become such a popular solution. To help you decide if artificial turf is for you, we take a look at some of the top benefits you can expect from an artificial lawn. Perhaps the most obvious draw of artificially installed turf is the near complete lack of maintenance needed. Put your lawnmower on early retirement, and enjoy a lawn that doesn’t need trimming, and eliminate that post-mow rake job too. In the summer months, natural lawns run the risk of getting dried out an discoloured during dry spells, but with artificial grass you won’t need to worry about hosepipe or sprinklers, as the colour will stay bright and fresh in any weather. In fact the only maintenance you’ll need to worry about is the odd ‘fluffing’ of the grass blades with a stiff broom, in order to keep the texture bouncy in high-footfall areas, and occasionally clearing any debris with a brush or leaf blower. This may not be the first thing you think of when considering artificial turf, but it is a surprisingly environmentally friendly garden option. Banning the hosepipe and sprinklers doesn’t just reduce your maintenance time, it also conserves water, especially during particularly dry summers when water should be used economically. Your retired lawnmower will reduce both your energy and emission footprint, and your lawn’s new self-sustaining nature means you can say goodbye to potentially harmful pesticides, herbicides and fungicides too. 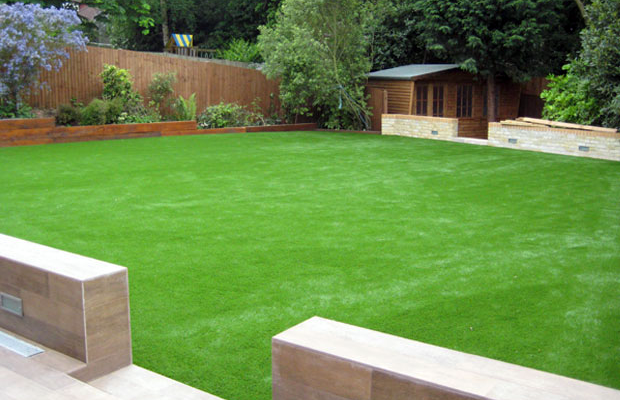 With an artificial lawn that takes care of itself, the environmental benefits speak for themselves. Genuine grass means genuine soil, and we all know the British climate is no stranger to the odd downpour. Children and pets are generally less than discerning of muddy puddles when it comes to play time, and anyone who’s tried to clean muddy trainers or shift grass stains will know what a stubborn challenge it can be. Your washing machine can breathe a sigh of relief with an artificial garden installed, as it provides a soft play surface for children and animals, but without the stained clothing that goes hand-in-hand with a natural lawn. Each of the benefits mentioned come with a notable bottom line – artificial turf is a real money-saver. Low maintenance means low spend, in terms of cutting back your energy bill by ditching the lawnmower, your water bill by getting rid of the hosepipe, and your upkeep bill by forgetting about fertilizers and pesticides. Less muddy clothes means less of a strain on your washing machine and its washing powder bills, and less baths required for the family pets. And as an extra bonus, hay-fever sufferers can pocket the savings when it comes to antihistamines. 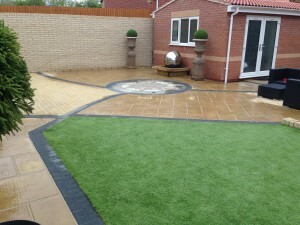 Here at Groby Landscapes, we’ve been providing professional landscaping services since 1964. With affordable rates, and a large selection of artificial turfs to choose from, we’re ready to help you enjoy all the benefits listed above. 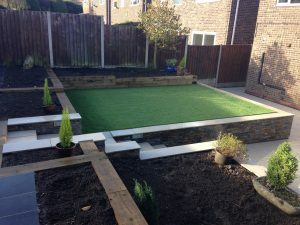 We’re also experts when it comes to planting, fencing, patios, water features, driveways and deckings, so contact us today to discuss your landscaping requirements, and obtain a free quote from our friendly team.